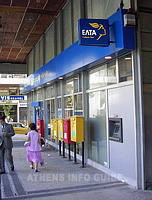 Post: The Greek postal service is run by ELTA. The main post office is situated on Syntagma Square and is open 08:00-20:00 Monday to Friday, 08:00-14:00 Saturday and Sunday 09:00-13:00. Otherwise post office hours are generally 07:30-14:00 Monday to Friday; the airport and railway station post offices have longer opening hours. There are Poste Restante facilities at most post offices in the city. Advance notice is required except at the central office and a passport must be shown on collection. Other post office facilities include fax and courier services. Postage takes approximately five days to the rest of Europe, six days to North America and seven days to Australia. There are stamp vending machines and post boxes outside all main post offices. Post boxes and post office signs are bright yellow. Courier services: The post office provides an international Express Mail Service and domestic porta-porta courier mail service. Courier services are also offered by DHL International Hellas AE, Alimou 44, 174 55 and TNT International Hellas Ltd, El. Venizelou 32, 166 75 Glyfada. 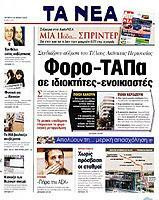 Press: There are 18 daily newspapers in Athens including Ta Nea, Eleftherotypia and Eleftheros Typos. The English-language dailies are the Athens News and the Athens Daily Post. The Hellenic Times is published weekly. Major international newspapers are also available usually late in the morning. Entertainment listings in English can be found in the monthly Athenian magazine, the daily Athens News and the weekly Athenscope magazine. Telephone: The Greek telecommunication network supplier is Organismos Telepikinonion Ellados or OTE (pronounced oh te). The network is undergoing a modernization program to digitalize the system. Public card phones are ubiquitous and cards can be purchased at kiosks or at local OTE offices. Calls can also be made from OTE offices and telephone kiosks. The OTE office near Syntagma Square at Stadiou 15 is open 24 hours daily (tel: 134). Local and long distance calls are cheaper on Sunday, after 22:00 on weekdays and after 15:00 on Saturday. Mobile phones: There are two frequencies for mobile phone use in Athens: GSM 900 and GSM 1800. Visitors from the USA and Canada will need to buy or hire a European-standard handset and use it in conjunction with a SIM card in order to make a call in Greece. All foreign visitors should consult their service provider for details of roaming agreements that will allow them to use their mobile phones in Greece. TV and radio: Most TV stations carry some English-language programs. Satellite stations, such as CNN, Euro news and TV5, are available on UHF channels. Radio news is broadcasted in English on Athens 98.4 FM at 08:30, 09:30, 12:30, 16:30 and 19:30 daily, and at 07:40 daily on Greek Radio 1 (91.8FM). Galaxy Radio features the CNN Radio News every hour on the half hour (92.1FM).